For your safety and comfort, try washing with a handheld shower head that you can use while sitting or standing. 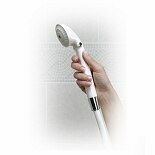 Handheld showers are available with different features, and you can choose a hose length that meets your needs. For a custom shower that's comfortable and effective for you, try a handheld shower head from brands such as Moen, Medline or Drive Medical that offers settings to control water flow. Besides being able to control your water flow settings, you can customize your total shower and bathroom to make it safe and comfortable for you to use each day. Find the bathroom safety products that you can depend on, whether you could use a simple grab bar on the shower wall or a shower stool made with a holder for your handheld shower head. Using a non-slip bath mat on your tub or shower floor can help make showering and bathing safer and simpler. If you could benefit from a whole set of bathroom safety items, consider a bath safety kit. There are kits that include a handheld shower head as well as a bath mat, bath seat and suction cup grab bar. To reduce stress on your joints caused by sitting and rising, try using a toilet seat riser made of comfortable materials. You can find elongated seat risers and standard raised toilet seats for the size and shape you need.